The ship still needs lots of texture work and better lighting, but I wanted to show at least some progress. 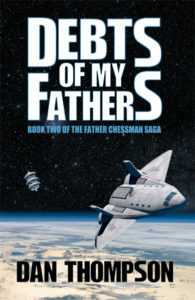 This entry was posted in Writing & Publishing and tagged Debts of My Fathers by DanThompson. Bookmark the permalink. I found your other blog while doing research about space elevators. Then I hopped over here and couldn’t stop reading. For this book cover, it’s very good. Did you do that yourself or hire someone? 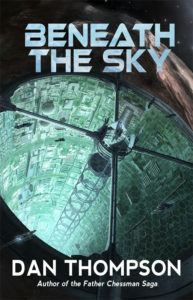 Also, I have a physics question about the space elevator that I’d love to get your take on. In the book I’m writing, Last Outpost, I have passengers traveling up the elevator in an ascender. I’m making a leap that they are somehow “protected” from the (increasing?) centrfugal force by systems I call paragravity dampeners. IDK. Sounds good, right? Anyway, I’m struggling to comprehend changes in g-forces pulling against the ascender as it climbs. If the ascender breaks down at, let’s say about 39km above the earth, what sort of g-forces is the Ascender pulling? Thought experiment: At this same attitude what would happen if someone had to “step” outside of the ascender (no longer within the dampeners) to make a repair? How might this look at 340 km? Ps. just picked up Beneath the Sk in Amazon. Looking forward to reading! Have a great day! 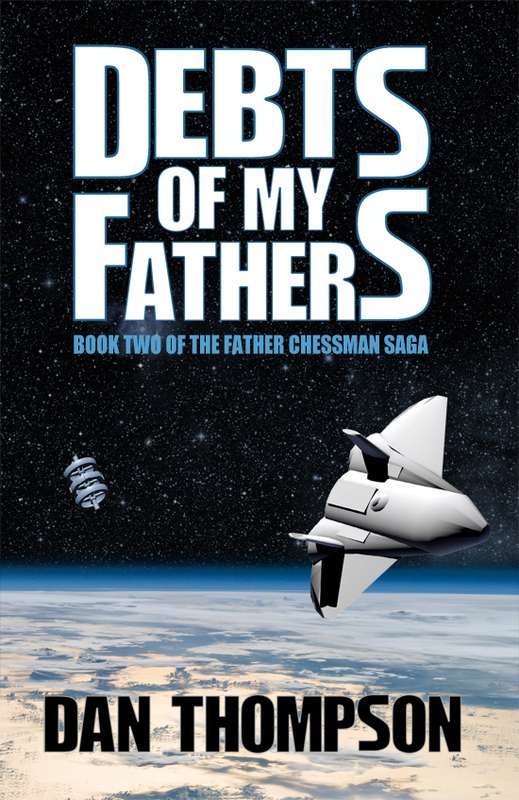 On the cover, yes, I did it myself, but I still have a lot of texture work to do on the models. So, at the relatively low altitudes of 39km and 390km, there’s not much centrifugal force yet. The experience there is dominated by Earth’s gravity, which is dropping with altitude, but not all that fast. Consider that you calculate gravity from the center of mass, i.e the center of the Earth, so the difference between 39km and 390km is not 10x. Rather, it’s really the difference between 6310km and 6761km, a mere 7% increase in distance from the center of mass. It shows that at 39km, gravity is 9.68m/s^2, and gravity at 390km is 8.7m/s^2. So, in stepping out to do repairs, it would be like being outside a skyscraper with only a little less gravity. Oh man. I guess I’ve been coming at this all wrong. I couldn’t overcome the notion (assumption) that the movement of the elevator cable would have the same centrifugal effect on a traveling ascender as would something on a string being swung in the air–growing more intense with altitude. But as you said, not at the altitude I’m working with. Then, if the brakes on the stranded ascender gave out, the thing would not fly up, it would fall down. (sigh) Time to rewrite that chapter! lol. Thanks for taking the time to write such a thorough response! I’ve not had anybody qualified I could talk to about this. They all look at me like I’m speaking another language. Really appreciate it. 🙂 Ps. do you offer your book design as a service for sale? I’d be very interested in talking more about that with you. Well, you can still deal with the flying out problem if the altitude is beyond the geostationary altitude because at that point the centrifugal force *will* exceed the gravity. However, most arrangements put a station around that altitude, so they’d have likely already reached their destination. You might also look up Amy Beth Inverness. 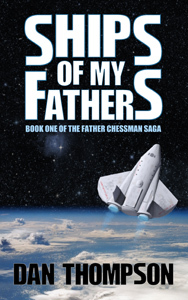 I believe she’s written some stories with space elevators and may have more thoughts on mechanical failures and plot twists. But what about the book? When’s the release date? I’m really trying for this week, i.e. before the 12th. 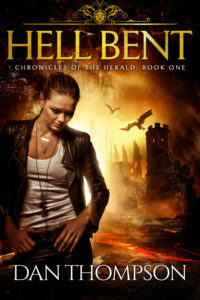 Hell Bent is released at last! Bob Enyart on I am alive.